Living a Fit and Full Life: MagicMeeMees are Sure to be a Hit this Holiday Season! MagicMeeMees are Sure to be a Hit this Holiday Season! Discover these adorable friends inside your fruit bowl, your candy jar, your refrigerator, and all around! So small, only 100 millionth of the size of you! Take them on adventures as they make friends, eat tasty snacks, and play in their magical worlds! MagicMeeMees are the most adorable little creatures that live all around us! So small, 100 millionth the size of you! MagicMeeMees are an absolute hoot! My kids absolutely love MagicMeeMees because they interact with each other and display different lights based on their emotions. Some MagicMeeMees like each other and some don't and they express that by their different colored lights. They also interact with the different types of food that come in the blind bags as well as the play sets. Some magic MagicMeeMees like certain play sets and some don't. It's incredibly fun and entertaining to learn what these little guys like and don't like. My kids loved finding foods that the MagicMeeMees loved and thought it was funny when the MagicMeeMees expressed that they weren't a fan of certain foods. MagicMeeMees entertain my kids for hours and I suspect these to be a huge hit this holiday season! 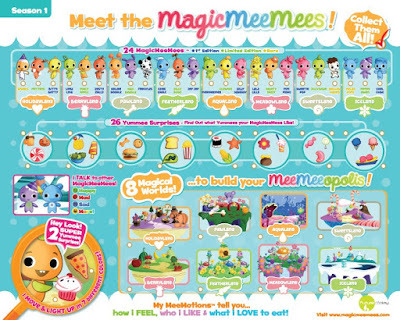 You can purchase MagicMeeMees at Amazon.com, Walmart, Target, Kmart and ToysRus! Click HERE to learn more about MagicMeeMees! Follow MagicMeeMees on social media!